Join us for our 14th tour to India for unlimited access to temples, ashrams and holy teachers and saints. Sridhar has been traveling throughout India since 1980 and has met some of the most revered teachers in India. He has unparalleled associations with them, and so will you! If you ever wanted to go to India, had only a brief two weeks, and wanted to make sure everything was taken care of for you, then this is the tour for you. 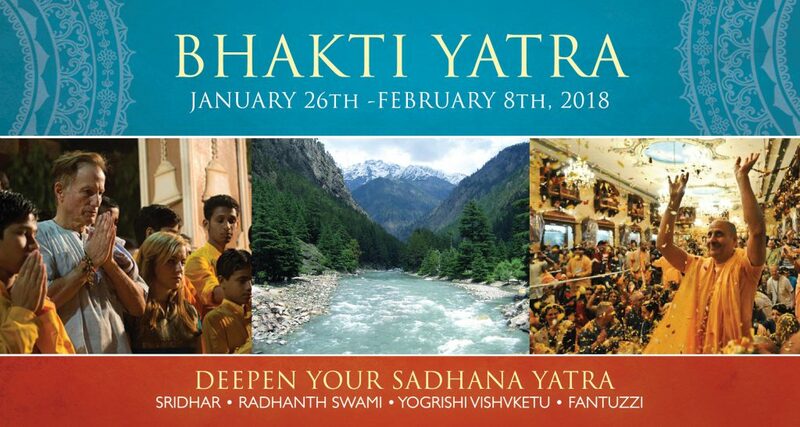 We will dive deep into our personal sadhana with yoga, daily satsangs, associations with great teachers, three vegetarian meals per day, wonderful high-standard hotel accommodations. Pricing is the lowest tour to India offered this year by any group. $1950 for 14 days. Then to the Himalayas, to the ancient city of Rishkesh, we will visit Swmai Chitanad, Satvigi, Swami Ramkripalu, Swami Bramananda, and others. We will take our ritual cleansing bath in the Ganges and explore the Kanji Puri Temple, Visitha Gupta, and Dev Praga, the crossroads of the two main rivers. We will also ensure we have time for seva at Ramana’s Garden, another of our primary children’s charities, where we will be giving a benefit concert to help raise funds for them. While in Rishikesh we will also be studying Yoga with the Yoga master Yogrishi Visveketu. We will be going strong during this Yatra, taking in as much as we can in a short time. For ease of travel and deeper personal growth, numbers will be limited to an intimate group. Now is the time to make a commitment and come with us for a once-in-a-lifetime, unforgettable experience to deepen your life’s work. No past experience required, only your dedication to going deeper then your regular yoga classes, and the realization that there’s so much more in life. $1950 PLUS international travel and domestic flights. Everything else is included; hotels, car transportation, bus transportation, three meals a day, entrance into temples and ashrams. Pack light and go deep.